As anyone who owns a home or facility with a pool can tell you, pools just aren’t any fun if nobody wants to swim because the water is too cold! This is where the importance of having a reliable pool heater comes in, as no matter which season it is, you can keep the water in your swimming pool at comfortable levels, all with the help of these heaters. Not only does this bring more enjoyment to bathers, but by extending the swimming season, you can also add more value to your property or facility, thus making heaters a worthwhile investment. When selecting a heater, it is important to make sure that the heater you will be installing is durable enough to withstand the elements and varying external temperatures. Other factors to consider include the amount of time that it will take the heater to bring the water to comfortable temperatures, as well as the heater’s energy efficiency levels. This last item is particularly important because a poorly-constructed heater with low energy efficiency can result in skyrocketing power or gas bills. For decisions like this, it is vital to consult with professional pool equipment technicians, such as Sterling Pool Service. We have been providing services and equipment to residents and businesses in North Dallas and its surrounding areas for more than 26 years. 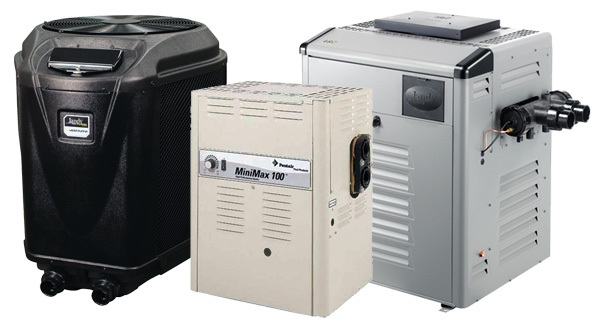 Our licensed personnel have the necessary expertise to help you determine which type of heating equipment will be best for your pool, depending on dimensions, location, as well as according to your specific needs. So for all of your pool heating needs, give us a call at 888-973-0274. Our lines are open from 8:00am to 4:30pm Mondays through Fridays, and our friendly staff will be happy to answer all your inquiries. We can also be contacted via the form on our website, and make sure to also inquire about our FREE weekly service agreement and FREE pool renovation bids! Reach us on our Contact page.